Today I am going back to my French Ultramarine Blue and adding it as an under-painting where my darker values will be developed. I like to build my shadow areas with glazes. 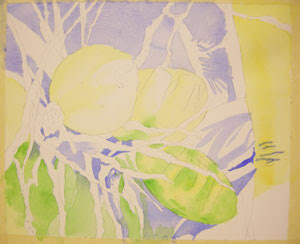 If I start out in the light to middle value range, I can easily correct colors as I progress through the painting. 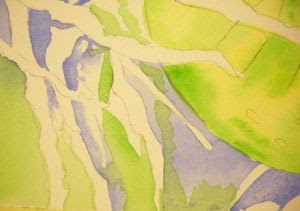 This process also helps me to navigate through the piece. Each painting is a study project for me. I love to study the values, shapes, colors and textures of whatever I am working on. If I work slowly, I can see more clearly every little detail. Since this piece is very detailed and there is a lot more in the reference photo than I actually want to paint, I sometimes use bits of scrap paper to mask off areas of my reference photo. This helps eliminate some of the visual clutter in a very detailed subject and I can more easily focus on the area at hand. I have added some Permanent Sap Green in the cooler, shady areas near the bottom of the piece. I varied the concentrations, values and edges to help create depth and interest.